My new Boulder friend and I are still in our “test each other out to find out if we are compatible adventurers yet” mode. Our next “test”: Hiking Indian Peaks Wilderness (and finding out if we can agree on which trail to hike…). We opt for the Mitchell Creek trailhead, which provides access to a number of fabulous trails, including Lake Isabelle. Because I have recently hiked to Lake Isabelle, we agree on Mitchell Lake and Blue Lake, which take us on the northern side of Pawnee Peak. It is an easy day hike of under five miles, round-trip. The weather is perfect for hiking on this bright, sunny Thursday morning on July 1st. Slightly cool compared to Boulder today, as we are over 10,000 feet in elevation. 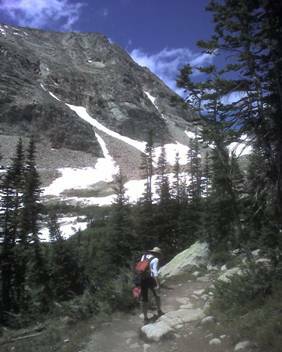 Like many trails in Indian Peaks, this one has you first pass through a pleasant pine forest. Flanking us a number of times on both sides are picturesque lakes, early wildflowers (peak season will not be for another few weeks), and streams. Summer is still so new in the Peaks that remnants of snow drifts from the previous winter season still persist. The trail on this day is rather muddy and often little more than a rocky creek as summer snowmelt creates a number of streams. Often, we find ourselves crossing snowfields – particularly when we go off-trail to get a closer look at lakes and streams near us. The scenery is stunning and literally breathtaking. An excellent barometer of the quality of scenery is that I am unable to stop snapping photos with my Verizon Treo SmartPhone (a phone that I was nearly bullet-proof in the 700 series I have). Gorgeous, crystal clear lakes. Enormous mountain slopes streaked with fingers of snow from the previous snow season. Grand, seemingly endless vistas. In addition to being relatively short, this trail is relatively level, which makes for an ideal choice for those who are not Olympic in athletic skill. Indeed, for a short while we hike with an 84-year old woman who is spry enough, with her hiking poles, to be enjoying the majesty of the Wilderness. To our right looms Mt Audubon (13,223 feet at the summit), an excellent hike I have previously experienced. To our left, Pawnee Peak is a few feet shy of 13,000 at its summit. We reach the Blue Lake terminus of the hike. In front of us, Blue Lake is still mostly frozen over. A number of dramatic waterfalls feed the lake from multiple directions. At the edges, the lake has melted and we can see what appear to be tiny iceberg fingers that form curving patterns under the strikingly clear ice water. Forming the western amphitheater of Blue Lake are Mt Toll and Paiute Peak. Paiute stands at over 13,000 feet. Toll reaches just under 13,000 feet in elevation. A number of times, we see cute little marmots scurrying around us playing hide-and-seek. The Indian Peaks Wilderness is a wilderness area in north central Colorado managed jointly by the United States Forest Service and the National Park Service within the Arapaho and Roosevelt National Forests and small parts of the southern section of Rocky Mountain National Park. It borders the James Peak Wilderness to the south, and straddles the Continental Divide. The area encompasses a stretch of the Front Range. It includes seven peaks over 13,000 feet in elevation. The highest point is North Arapaho Peak at 13,502 feet. The peaks are all within 100 feet of elevation of each other. A portion of the area, encompassing the headwaters of North Boulder Creek, is closed to the public as it is the City of Boulder watershed. Many of the peaks inside the wilderness area are named after western Native American tribes. 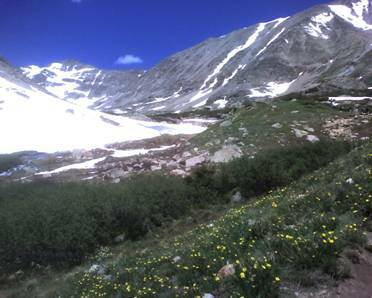 Indian Peaks received protected status in 1978 when Congress designated the Indian Peaks Wilderness Area.